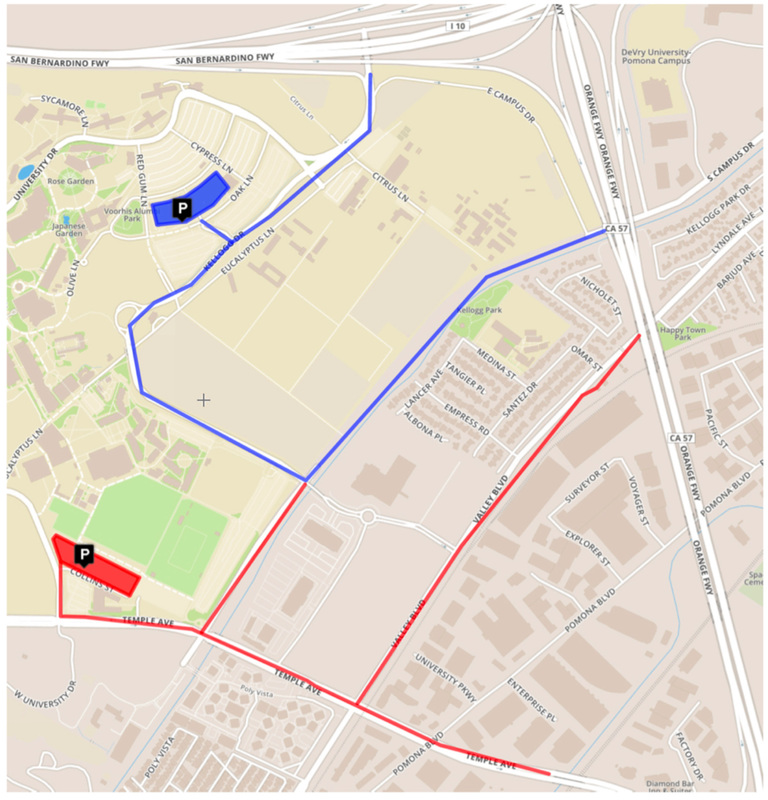 Directions for getting to our campus and for walking from the parking structures to the music building are included below and in the above link. Please remember that parking permits are required to avoid getting a parking ticket! 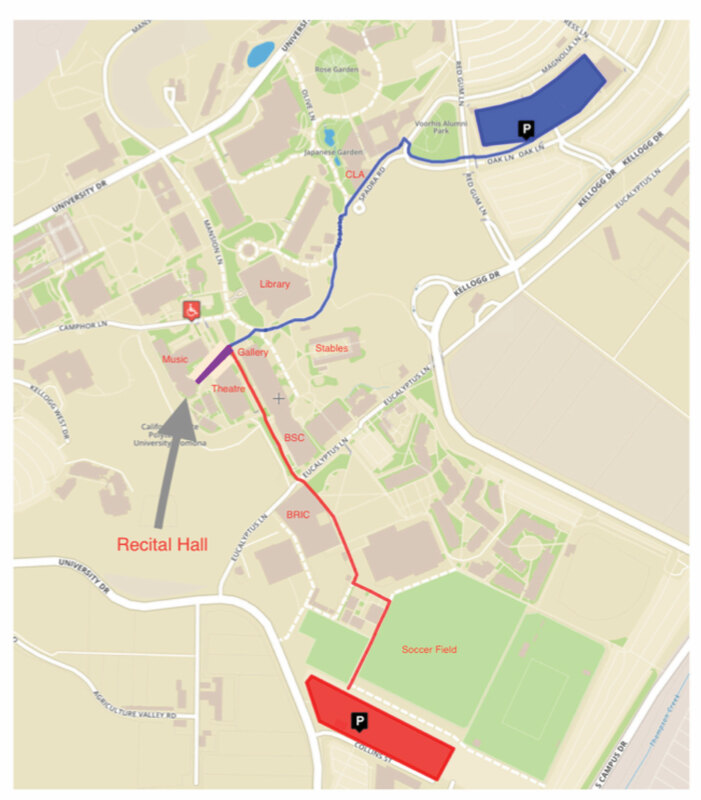 FOR GUEST ARTISTS AND CLINICIANS that need to pick up a parking permit, please use directions for Parking Structure 1 (BLUE) on Palm Drive and drive up to the information kiosk to pick up your permit before parking. FOR CONCERT PATRONS AND ALL OTHER VISITORS, we recommend parking in Parking Strucutre 2 (RED) on Collins Street at the corner of Temple Avenue and University Drive. Take the 210 freeway and follow the junction to the 57 freeway south. Exit on Temple Avenue and turn right (down the hill). Turn right on South Campus Drive (you should see a large electronic marquee). Turn left on Kellogg Drive, and turn left on Palm Drive. Proceed into the parking structure. Pay stations are on levels 2 and 4. Permits are $7 weekdays and $4 on Saturday and Sunday. Exit at Kellogg Drive. Stay in the left lane. You should pass to the left of the large electronic marquee. Follow Kellogg Drive and turn right on Palm Drive. Proceed into the parking structure. Pay stations are on levels 2 and 4. Permits are $7 weekdays and $4 on Saturday and Sunday. Follow the junction onto the 57 freeway north. Exit at Temple Avenue and turn left (down the hill). Turn right on South Campus Drive (you should see a large electronic marquee). Turn left on Kellogg Drive, and turn left on Palm Drive. Proceed into the parking structure. Pay stations are on levels 2 and 4. Permits are $7 weekdays and $4 on Saturday and Sunday. Exit at Diamond Bar Boulevard and turn right. Turn left on Temple Avenue, right on South Campus Drive, where you should see a large electronic marquee. Turn left on Kellogg Drive, then left on Palm Drive. Proceed into the parking structure. Pay stations are on levels 2 and 4. Permits are $7 weekdays and $4 on Saturday and Sunday. Take the 210 freeway and follow the junction to the 57 freeway south. Exit on Temple Avenue and turn right (down the hill). Turn right on University Drive. Turn right on Collins Street and left into the parking structure. Pay stations are located throughout the structure. Permits are $7 weekdays and $4 on weekends. Exit at Kellogg Drive. Stay in the left lane. You should pass to the left of the large electronic marquee. Follow Kellogg Drive and turn right on South Campus Drive. Turn right on Temple Avenue. Turn right on University Drive. Turn right on Collins Street and left into the parking structure. Pay stations are located throughout the structure. Permits are $7 weekdays and $4 on weekends. Follow the junction onto the 57 freeway north. Exit at Temple Avenue and turn left (down the hill). Turn right on University Drive. Turn right on Collins Street and left into the parking structure. Pay stations are located throughout the structure. Permits are $7 weekdays and $4 on weekends. Exit at Diamond Bar Boulevard and turn right. Turn left on Temple Avenue. Turn right on University Drive. Turn right on Collins Street and left into the parking structure. Pay stations are located throughout the structure. Permits are $7 weekdays and $4 on weekends. Handicap parking is available by the Music Building on both sides of Camphor Lane. From Temple Avenue West turn right onto University Drive. Turn right on Camphor Lane until you reach a gate. Parking is on left and right. The Music Building and Recital Hall are to your left. Upon exiting Parking Structure 1, cross the street toward Voorhis Park. Continue past the CLA Building, with its pointy, triangular top. Follow the path as it curves to the right, between the old stables and the University Library. Keep going straight until you reach the Theatre/Music courtyard. Pass under the Breezeway to the Recital Hall. Exit Parking Structure 2 at the Elevator area located in section A/B. Walk out of the structure and continue with the tennis courts on the left and the soccer field on the right. Turn left just past the English Language Institute portable buildings. Walk past the swimming pool and the BRIC (Bronco Recreation and Intramural Complex), both on the left. Follow the path across Eucalyptus Lane and up the hill. On your right will be the BSC (Bronco Student Center), on your left, the University Theatre. Turn left at the end of the Theatre building. Pass under the Breezeway to the Recital Hall.